Although we have not traveled extensively, we do try to eat local when we are trekking around a new place. That all being said, some of the food that passed through Fuchsia Dunlop‘s lips would never have made it passed mine. Welcome to this round for Cook the Books. 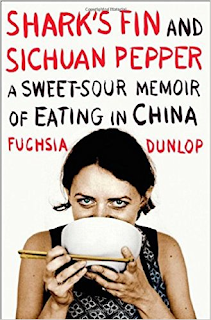 Deb from Kahakai Kitchen is hosting Dunlop’s Shark’s Fin and Sichuan Pepper: A Sweet-Sour Memoir of Eating in China. I started out enjoying Dunlop’s memoir, even if parts were a bit redundant and lagged. I enjoyed her discussion of the Sichuan area of China and the regional differences that abound. Hats off to Dunlop for her total immersion into the culture. I couldn’t have done it. And, I found the bulk of the book just more of the same—weird eats. Dunlop (ad nasuem) describes (over and over again) eating odd and disgusting (at least to this Westerner) stuff. I have experimented a bit with Sichuan peppercorns and I like the overall punch of acid of this unique spice. Although my Sichuan pepper went into the making of hot chili oil, I adapted a salad recipe to highlight the spice. Combine garlic, ginger, tahini, vinegar, soy sauce, and honey in a large bowl and whisk to combine. Add in chili oil. Whisk to emulsify, adding a few tablespoons of water if it is too thick. Toss cooked noodles in sauce. Arrange cucumber shavings, green onions (white and pale green parts), cilantro, and sesame seeds on noodles. 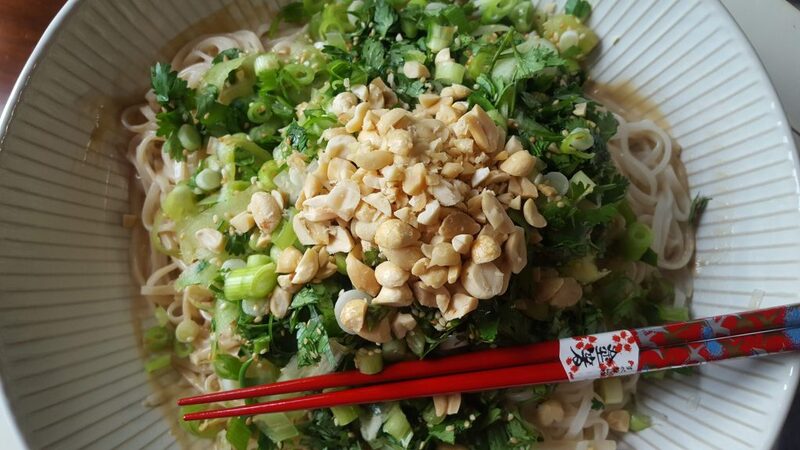 Top with peanuts and chopped green scallion tops. Toss again at table before serving to coat the cucumbers, cilantro, and peanuts. *Depending on how hot you want this dressing, you may want to cut the chili oil with a mild oil like grape seed oil. Yes, Dunlop is a much more adventurous eater and traveler than I. I take some consolation that she dosed herself up with alcohol before she partook of some items. Alcohol can make one eat almost anything—even rabbit head kabobs (45). As for myself, I agree with her friend Liu Yoachun: “I’d really be just as happy with a bowl of noodles” (131). Please join us for the June/July selection hosted by Claudia (Honey from Rock). We are revisiting another Ruth Reichl classic with Garlic and Sapphires. Look for an announcement post soon at Cook the Books. Deadline for submissions will be July 31, 2018. 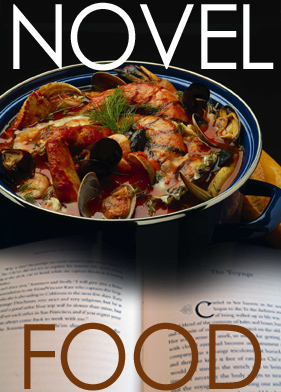 I am also linking up with Deb’s Souper Sundays, Novel Food, and Foodies Read for May. That’s my favourite summer dish! So appetizing and yours looks authentic and delicious, Deb. Like you, I bought those weird peppercorns when I read the book a few years ago (my culinary reading group also read it). I wonder if they are still ok to use — the effect of numbing the mouth is really kind of strange, isn’t it? The book did get repetitive for sure but it seems to have inspired some spicy and delicious dishes. I have a couple of Dunlop’s cookbooks, and like them. This book sounds like it wouldn’t be so much to my taste — a bit tedious. She sure can cook, though! This salad looks excellent — tons of flavor, and easy to make. Winner! I’m always happy with a bowl of noodles! Not familiar with Dunlop’s cookbooks – they sound interesting, but probably, like you, not the kind of thing I would cook and eat on a regular basis. I did enjoy this very interesting memoir, and her cookbooks as well. I’ll have to try your flavor packed salad, another good use for my Sichuan peppercorns. I’ll be happy with a bowl of noodles as well, and yours sound fantastic. I totally agree with you, there are many things that I wouldn’t dare try eating. But your noodle salad would go down easily.